The Everlast neck developer is a practical device for strengthening neck muscles. The intensity of the Everlast neck developers can be individually adjusted. A chain for putting on weights is included in delivery. The Everlast neck developer is equiped with double-reinforced, padded nylon straps, ensuring a secure workout. prima hulpstuk voor de nekspieren; voldoet aan alle eisen die ik verwacht had. 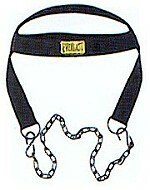 Sport-Tiedje Weight Holder for Head Harness In stock!